The Effect of touch screens and gadgets on early Child development is the reason behind this common scene in every house. A few months back I saw a video on YouTube where a small child aged 1-year was sitting in front of a fashion magazine, gaming touching and swiping the page with her fingers in an effort to get the images to move. Now this did initiated a laughter blasts amongst the parents and people around but it left me thinking for sure. Is our young generation so habituated to technology that they believe that their like and dislikes can be easily and quickly controlled just at a click or simply pressing a button?? 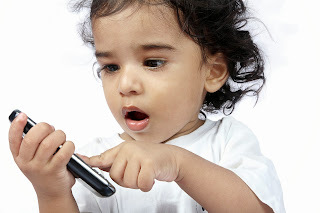 The effect of touch screens and other electronic devices on young children is an explosive issue. Kids are very, very responsive to the kind of stimulation they get from video games, educational or not. In the two years since this video was made, digital industry has responded with apps for babies and preschoolers. Such technology is available at Pre Schools even. Our concern must be with the negative effects on those children of parents who are unable to put down their phones, tablets and laptops because these babies intently watch their parents and promptly tune into their distraction. At Shanti Juniors our I3 Learning ladder is implemented for kids to induce age appropriate curiosity and thinking in a children’s mind which will create a rational and positive creativity in them. Share their daily routines, Listen them. There is no better substitute for sitting with your children at the end of the day listening and sharing their daily routine, reading out a story to them or even playing a simple game. A child can no where develop more in any other environment than this one. However glamorous, technological or this digital world gets nothing could be more effective than a Parent –Child Interaction. Parents must understand this and start acting towards the same before our next generation loses emotional values. These technical gadgets can accompany your child in later years of life but not right now. Let them Celebrate their Childhood instead of Techno-hood. Every Child wants to Explore, Lets make it curious enough! Your internet site helps it be really easy to learn, comment and share! I am extremely impressed with your writing skills and also with the layout on your weblog. Is this a paid theme or did you modify it yourself? Either way keep up the excellent quality writing, it’s rare to see a nice blog like this one these days.. I just wanted to compose a note in order to express gratitude to you for some of the splendid pointers you are giving on this site. My extended internet lookup has finally been compensated with wonderful tips to write about with my guests. I ‘d say that most of us site visitors are undeniably lucky to live in a fabulous site with many lovely people with helpful guidelines. I feel somewhat grateful to have encountered the web pages and look forward to really more amazing moments reading here. Thanks once more for all the details. I¡¦ll right away take hold of your rss as I can not to find your email subscription link or e-newsletter service. Do you have any? Please allow me understand so that I may just subscribe. Thanks. You can certainly see your skills within the work you write. The arena hopes for more passionate writers such as you who are not afraid to mention how they believe. Always follow your heart. Hello there, I found your website via Google while searching for a similar subject, your site came up, it seems to be good. I have bookmarked it in my google bookmarks.